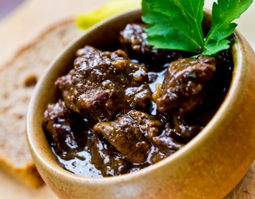 Beef Stew with Coffee and Wine - A recipe from Savor California, the online showcase for extraordinary gourmet foods and beverages from California. Jeremiah's Pick Coffee adds extra life and depth of flavor to this stew. Since the coffee is such a key ingredient, it's important to use really top-quality coffee! The wine can be medium quality. Cut the stew meat into chunks. Bring oil to its smoking point in a pan on the stove. Season beef with salt and pepper, then brown all of it in small batches, making sure that the pan isn't overcrowded, so that the beef is lightly caramelized. Once all meat is browned, cook onions, mushrooms, and garlic in the remaining fat in the pan. Do this until onions are translucent. Add coffee, beef stock, red wine, and capers to the vegetables and stir this mixture. Add beef into the mixture, bring to a boil then reduce heat to low.